Experience Jeff Hanson’s amazing story LIVE for your next event! You and your guests will enjoy meeting the visually-impaired artist, Jeffrey Owen Hanson, accompanied by his parents, Hal and Julie. And they will be riveted by Jeff’s inspirational story in a one hour, multimedia presentation. Speaking live before a magnificent video/music backdrop, Jeff and his parents reveal what Jeff’s brain tumor (named CLOD) taught them about art, philanthropy, and entrepreneurship, during their journey through adversity. Don’t let your CLOD define you. A powerful, motivational presentation for any audience, the program encourages generosity, philanthropy, corporate giving, and inspires anyone suffering adversity, illness or hardship. 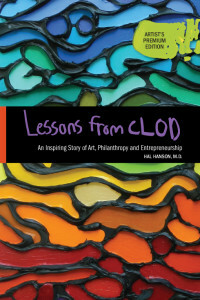 A hardbound, full-color book, Lessons From CLOD, authored by Jeff’s father, Hal Hanson, MD, is also available for attendees of your event. Lessons From CLOD is not simply a keynote speech or lecture, it is an uplifting, motivational, multimedia experience. The technical production is designed for larger venues, requiring HD projection and superior sound systems. It is intended for conventions and corporate events, and cannot be produced for small groups. However, you can contact us for personal appearances at other events. For more information and booking, contact us today! Heard your interview on Sen Bradley American Stories radio show. Inspiring story of living with overcoming your personal “Clod”. As a Radiologist I have seen patients with neurofibromatosis and appreciate the issues that you have had to deal with. Your art is beautiful and a gift to all of us less talented souls. Thank you for listening to my story on Senator Bill Bradley’s “American Voices” on SiriusXM POTUS. I appreciate you reaching out. I plan to phone you later today. In fact, our “Lessons From CLOD” inspirational keynote was presented at the NAYDO (North American YMCA Development Organization) in Detroit. Several on your YMCA Board members would have been in the audience. Come visit Jeff Hanson Art if your travels bring you to Overland Park, Kansas. Miss you in the neighborhood! So glad you now have both space to paint and a gallery! Oh, you are so kind to reach out. Thank you! You will have to come by the new Jeff Hanson Art Gallery & Studio this Spring when we have hours. Beautifully presented! We all have “CLODS” in our lives. Some are large and almost overwhelming, while others are small, yet noticeable. Purpose in life gives us purpose to achieve. We are defined by what we do with that purpose. It is a great pleasure to witness your purpose, along with your parents, for the greater good. You must know how many will be inspired to use their “CLOD” in life for the greater good. God’s blessing fill you and your family. I am so thankful that you enjoy following my art journey. THANK YOU! I appreciate the kind words you shared via my website. It is not the challenge, but rather your response to the challenge that defines you. Don’t let your CLOD define you! Jeff…you are an inspiration. As your mom says, you didn’t let yourself be defined by your “CLOD”. Please keep spreading your message and your beautiful art. I am so glad I was able to read your Dad’s book, “Lessons From CLOD” even though I wasn’t able to attend the “Lessons From CLOD” presentation you did in Pinehurst, NC. I will spread your word in as many ways as possible. In “Lessons From CLOD” LIVE!, our keynote motivational presentation, I inspire the audience by sharing three powerful messages. I jokingly nicknamed by brain tumor, CLOD, like a clod of dirt. I did not want to give my brain tumor a serious medical name. Optic glioma -that sounded too impressive and stately. Clod was perfect, a nerdy, dull and lame name. Granted CLOD and my low vision, have been challenges. And it would have be easy to allow my challenges to consume me, and surrender to them. But I was determined to find my way beyond adversity, and accomplish something improbable. “Don’t let your CLOD define you.” Do not let your problem become your identity. We all face challenges. But it’s not the challenge, but rather your response to the challenge that defines you.